Stacey Pickens (left) with AAP St. Marys talks with Apollo student Keithan Furr (right) about possible career opportunities. LIMA — Keithan Furr, a junior at Apollo Career Center, will be entering his senior year in the fall. 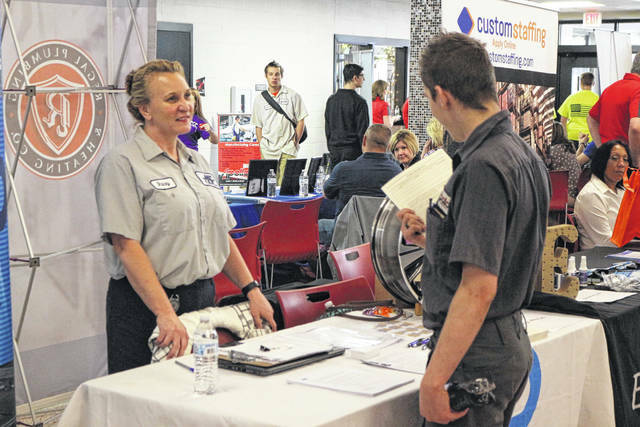 Furr was among hundreds of people attending a job fair at Apollo Thursday. Furr is studying automotive technology and is hoping to attend college after Apollo with dreams of opening up his own automotive shop. “I think it’s great and it gives us students a great opportunity to go around and explore potential careers,” said Furr. More than 80 businesses in Auglaize, Mercer and Allen counties set up tables in the commons area, looking for qualified candidates from not only the pool of Apollo students but from the public who also got a chance to check out the opportunities. Auglaize County employers have seen a rise in demand for jobs there. AAP in St. Marys was at the job fair. They make aluminum wheels for the automotive industry. Their customers include Honda, Nissan, Volkswagen, Tesla and Subaru. “Well, I think it’s a good place to start. These guys are hungry. They’re looking for work,” said Stacey Pickens, Associate Relations Specialist with AAP St. Marys Corp.
“We’re looking for, specifically, summer help. A summer job would be a temporary position. We are also looking for full-time production associates, maintenance associates, specifically, facility maintenance, engineering, supervisory and management positions. We have openings in almost every department,” said Pickens. Apollo’s reach in the region is strong. “One of the things that a lot of people don’t realize about Apollo is we partner with nine different counties. So not only do we serve Allen County, but we also serve the eight surrounding counties and one of the things that we do is as a part of the Workforce Development Board, both locally and in that particular region is we serve as a pipeline for skilled trades but also too, in the spirit of collaboration with all of the employers, not only in Auglaize County but in Allen County as well. So as we really have seen the shift for skilled workers go from one region to the other, understanding that this is the Greater Lima Region, a lot of the companies and manufacturers that we serve are actually based out of not only Allen County but Auglaize County as well,” said Tara Shepherd, Business and Industry Liaison at Apollo.